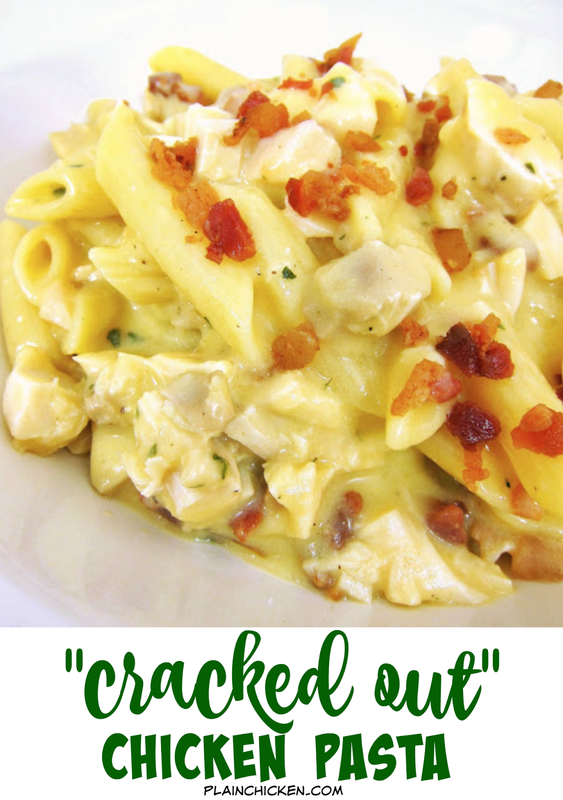 Cracked Out Chicken Pasta - chicken, and bacon tossed in a quick homemade cheesy ranch sauce! Ready in under 15 minutes. Such an easy weeknight meal!! Everyone in the family loves this! Serve with a salad and some crusty garlic bread - so delicious! We make this all the time! I've seen several versions of this pasta on Pinterest and it looked delicious. I decided to put my twist on the recipe and it turned out great! This is a one pot dish (Chicken Legs favorite kind of meal since he cleans the kitchen). I boiled the pasta and then used the same pot make the cheese sauce and toss everything together. I took a shortcut and used half of a rotisserie chicken and this was done in minutes. We both loved it. How could we not since it has all the flavors of our beloved "Crack" Dip in it! Serve this with a salad and some bread for a delicious weeknight meal! In a large pot, cook pasta according to package directions. Drain and set aside. In same pot melt butter. Add flour and stir. Cook flour for 1 minute. Slowly whisk in milk. Continue cooking until sauce thickens. Stir in ranch dressing mix and cheese. Stir until cheese melts. 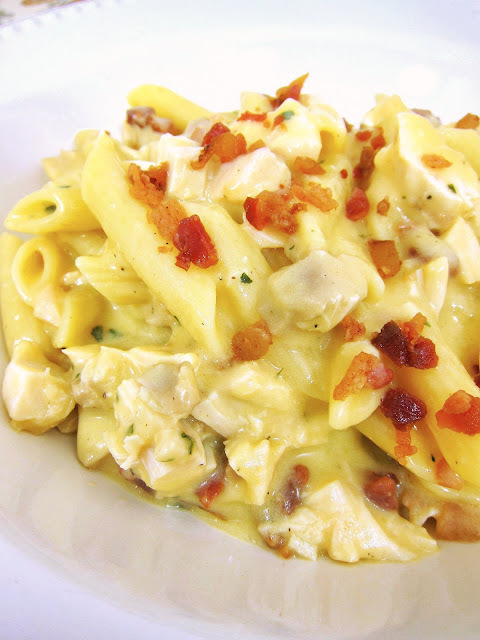 Add chicken, bacon and pasta. Stir to coat. Pinned! Oh my son would love this dish! I will be making this soon. If you get a chance come visit my blog and follow back. Have a great week. I love the ranch recipes! I can't wait to try this one! I have to admit that I've used leftover "Crack dip" on pasta before -- just cooked and drained the past and stirred in the dip. It's not so bad! Made this lastnight using bowtie pasta (WackyMac brand) and LOVED IT!!! Next time I'll add a little mustard to the sauce to kick up the flavor just a tad. Thank you for sharing this recipe. A keeper for sure. Made this last night and OMG GOOD! Husband loved it too. Only thing I may change WHEN I make it again, is cut back on the ranch seasoning. Maybe it was the brand I used but it seemed a bit too salty. Having said that, we both cleaned our plates - delicious! My husband made this for us the other night - it was delicious! Pinned it, gonna make it! So good made for dinner. I agree a little mustard would be good!! I tried this recipe last night. The flavor was great, but the sauce was really soupy. Any suggestions? Amberly - I think you might just need to cook it a little longer - it takes a few minutes to feel it thicken up. you could also add a little more flour. I am looking to make sympathy meals. The widow likes pasta. Do you think this would freeze well? If so, how would you cook it afterwards? I need to make these meals tomorrow (Sunday 10/1). Denise - if you want to freeze it, I would make it and then put it in a 9x13 pan. Reheat it in the oven at about 350. Try marinating the chicken in fajita seasoning. Someone suggested this to me in version that puts these ingredients on a pizza using ranch as the sauce and I though it sounded nasty but I took her at her word and there just are no tasty adjectives I could use to describe how even more over the top delicious I thought chicken, ranch and bacon could be. I took a shortcut and used "Real Bacon" bits. I've fixed this twice and shared it also. About how many does this recipe feed? I'm making dinner for 6 and was wondering if I should double the recipe or not. Thanks! Miss Hensley - it will serve 4. You can stretch it to 6 if you serve bread and salad. Omg I am all over this recipe! It's going on my menu for this week, thank you! Do you think this would be ok with canned chicken? I have some in the pantry and need to use it in something. Want to use chicken breast with other recipes on your blog. Debbie, I think canned chicken would be fine. Hope you enjoy it! Doubled this and fixed it tonight for my Grown Daughters and their Boyfriends, A HUGE HIT, no leftovers. Made this last night and everyone loved it! Thank you for sharing. How wuld you make this recipe if you had the packit off ranch all redy make. I want to make it but I dont have the dri ranch. The addition of sautéed onions and fresh diced tomatoes would be awesome! I just made this for dinner and it was delicious!!!! I used elbow macaroni and it turned out great! Thank you for a great recipe!!!!! I used this as the starting point for our dinner tonight. Followed the recipe, but used egg noodles cuz that's all I had. I added a bunch of spinach, upped the sauce amount slightly, and mixed it all together in a 9x13 pan. Popped it in the oven because I like crispy food, and holy smokes, this was so tasty! I want to try this tonight.... this looks delicious. How many people does it serve ? How many people does it ? I thought it was a chicken and macaroni and cheese pasta. Turned out the recipe was different. I would like to add those seasoning ingredients to my seasoning database. I just made this tonight, I added some button mushrooms to the mix and mixed mild and sharp cheddar cheese. It was delicious! The only thing I noticed, however, was that the sauce was a little clumpy, even after letting the flour cook a little bit and whisking everything pretty well... Wonder how to fix that? I suppose it will also taste good with ham, or better yet, the finest ham and bacon in melbourne will do just right. Very yummy. Used homemade ranch seasoning and there is plenty of flavor. Pasta always tastes better with wine, just as long as you have the finest choice. I get the best liquor online. How did you all cook the chicken first? Boil it? rotisserie chicken works fabulous with this! I almost don't want to believe that this can be put together that quickly. Usually, you'd expect food that looks and tastes that good to take a little longer to prepare, even by the best catering bristol company. Made this tonight. It was amazing! Added the mustard (very little) and poured the whole packet of organic ranch dressing seasoning, and used about 3/4 block of mild cheddar cheese (8oz). Delicious! Salad and bread made it a perfect full meal. Thank you! That would make a nice option for Friday pasta dinners around here. I'd add a few more greens like spring onion, celery, and diced or shredded carrots so it would at least help teach my son about children nutrition. Looks mouth-watering and appetizing! I've eaten some pasta that seems like this one into some catering services in Suffolk. I really fancy pasta these days, perhaps I'll be doing this one when my mom visited me. The pasta looks so yummy! I think this will match up best to the hibiscus flavored tea I'm currently addicted in drinking. Perhaps I should try eating this ranch pasta together with it. I made this for dinner tonight for my family and they loved it. I added mustard to it for taste and it came out awesome. Made this recipe last night and it was delicious! I doubled the recipe and I didn't have enough cheese so I added cream cheese and sour cream. I also added spicy mustard. Certainly a new favorite! This was a no go with my bunch. Too bad it looked very promising.It was eaten but will not be requested again. Will this work with ranch dressing not dry seasoning? After clubbing, my friends and I usually grab a bite somewhere or go straight home and whip up a quick dish. Since this recipe contains milk, do you think it will go well with the beer that's already inside us? Thank you for this delicious recipe! 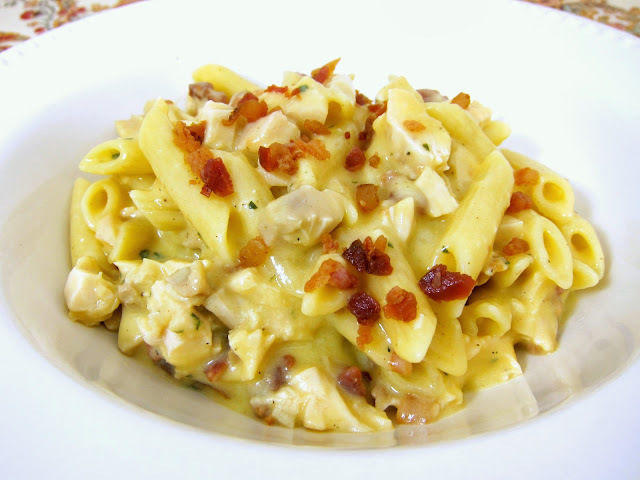 My wife and our kids really enjoyed eating chicken ranch pasta. Thanks for the wonderful recipes, time and time again. I've been cooking some dishes for my date lately and it's going on pretty well. You're a life-saver! I just love pasta! Always tastes best with wine, specially if you chose the best quality! I'll try this soon. Thank you! I've made this before and my fiancée and I really enjoyed it. I'm making it again tonight for friends but instead of chicken I plan on using chorizo. I'm crossing my fingers that all turns out well. Could you do this in a crock pot? I don't currently have a stove!!! I followed the recipe exactly the way it was written, and it turned out perfect. It was very good and we well definately make this again. Thanks for sharing. Oh my! Made this tonight for supper and it was delicious!!! I added white onion and sautéed with the melted butter and used the 'Fiesta' ranch mix. We can't wait to make it again!!! So creamy and yummy! Made this twice now and it's become one of our favorites! It's so yummy. Made this tonight and it was a hit! I used spiral noodles instead of penne, and my kids loved it. Thanks! Hey we made this tonight and the flavor was awesome, but the sauce came out gritty. Can't figure out what went wrong. Thoughts? I made this for lunch today. It was good, creamy and flavorful. We did not think it too salty. The only change I had to make was using less chicken. I didn't have as much leftover chicken as I thought I had. It turned out more like a jazzed up mac & cheese, but very good non the less.